As the volcanic eruptions of Eyjafjallajokull in April 2010 showed us, mass travel chaos that can last for days as a result of unforeseen and uncontrollable circumstances is not at all unlikely (albeit a rare occurrence). 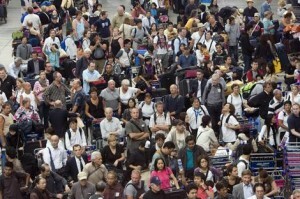 So what should you do if you happen to get stranded abroad as a result of flight cancellations? Alternatively, here’s a list of quick tips that could save you time and potentially money too (the hassle is yours to keep but that too can be limited). Sailing in Greece – Part I: Everyone’s invited! There are some ways to spend your summer holidays that are nice and relaxing and there are others that are likely to be some of the best days of your life. One such type of holiday is a sailing trip with friends or strangers who are after similar experiences. There are two types of people who will probably not find this article interesting. Those fortunate enough to already own a cruiser sailing yacht and those who are unfortunate enough to get seasick at the mere mention of the word “boat”. For the rest of you, stick around because what I am about to suggest, might just result in one of the best holidays you’ve ever had. You are currently browsing the escapious.com blog archives for August, 2012.
escapious.com by Themebuilder | Entries (RSS) and Comments (RSS).